These gorgeous Authentic Vintage Austrian Swarovski crystals have a border edge to make them reflect a lot of light and shine like crazy. It was difficult to capture the beauty of the cut on these crystals, it is truly mesmerizing and seems to have endless depth. I posted one earring alone so I could get a better close up of the earring and you could see some of the colors it radiates. These are circa 1950 and one of a kind. Beautiful blend of colors of blues, reds and golds and more are sculpted in sterling silver. 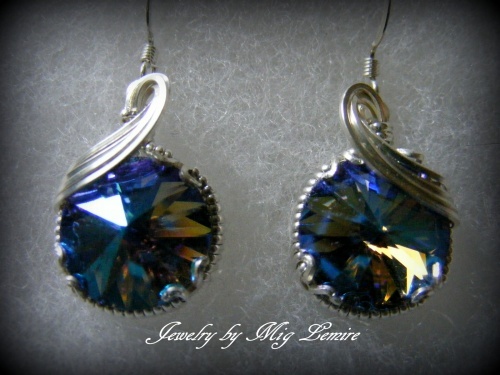 Earrings measure from top or ear wire to bottom of crystal, 1 1/4" long and 1/2" wide.